who deserve better, personalized care. and population health management services. We are a primary care supergroup with a women’s health focus, an exclusive independent practice association and a physician owned, led management company providing support. To stay independent, maximize practice profitability, enjoy a better work life balance and collaborate with like minded physicians. Retain more independence than is possible through employment by a hospital or health system. Facilitate greater profitability through marketing and ownership opportunities. Enjoy a better work-life balance as Square Care helps manage the administrative and compliance requirements of running a practice. Grow your network and enjoy the support of Square Care’s elite physician partners. Are you a physician and want to learn more? Square Care provides our physician partners with the opportunity to grow their practice while retaining their autonomy. Our selective criteria result in a high-quality network that enjoys favorable managed care contracts and the support of peers that facilitates business referrals and professional development. Plus, Square Care also helps our physician partners spend less time on administrative functions and do more of what they love. 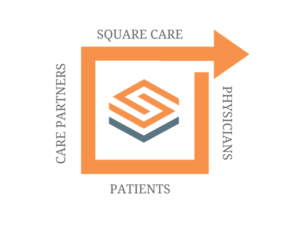 Square Care is a primary care Supergroup with a women’s health focus and a complementary IPA that provides our physician partners with an unparalleled network and the opportunity to grow a profitable practice while enjoying independence and work-life balance. I benefit more from Square Care’s network more than I had anticipated. Receiving qualified referrals and being able to expand the group of providers that I can feel comfortable recommending has helped my grow my practice and increase patient satisfaction. There’s no question that joining the Square Care IPA provides my practice with the immediate benefit of better negotiated managed care rates. I have a small, but growing practice. Having access to the MSO services has saved me an enormous amount of time and money. It’s a luxury to not have to deal with vendors for every administrative and system service. Square Care provides all the benefits of being part of a large practice group, but none of the downside. I manage my practice independently and enjoy the managed care contracting and referrals from other network providers.